An impressionistic glimpse into the poetry of broken people. 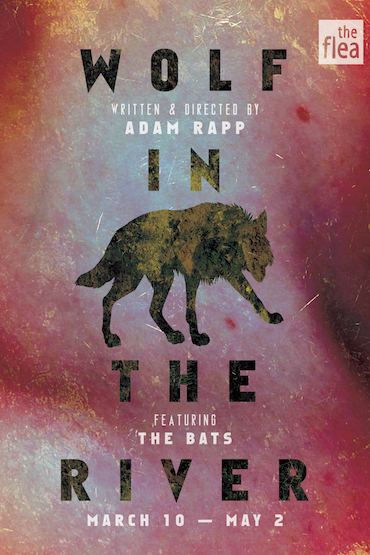 This American premiere production will be directed by Adam Rapp and will feature The Bats, William Apps, Maki Borden, Alexandra Curran, Karen Eilbacher, Jack Ellis, Kristin Friedlander, Jack Horton Gilbert, John Paul Harkins, Olivia Jampol, Artem Kreimer, Derek Christopher Murphy, Xanthe Paige, Mike Swift, Kate Thulin, and Casey Wortmann. The creative team includes Arnulfo Maldonado (scenic design), Masha Tsimring (lighting design), Michael Hili (costume design), Brendan Connelly (sound design), Zach Serafin (props master), J. David Brimmer (fight director), Anne Cecelia Haney (assistant director), Morgan Leigh Beach (production stage manager), and Annie Jenkins (assistant stage manager). ADAM RAPP is an award-winning playwright, theatre director, novelist, and filmmaker. He is the author of numerous plays, which include NOCTURNE (American Repertory Theatre, New York Theatre Workshop, The Almeida, London, The Traverse, Edinburgh), FASTER (Rattlestick), ANIMALS & PLANTS (A.R.T. ), FINER NOBLEGASES (26th Humana Festival, Rattlestick, Edinburgh Fringe, The Bush, London), STONE COLD DEADSERIOUS (A.R.T., Edge Theatre), BLACKBIRD (The Bush, London; Edge Theatre), GOMPERS, (Pittsburgh City Theatre, The Arcola, London), ESSENTIAL SELF-DEFENSE (Playwrights Horizons/Edge Theatre), AMERICAN SLIGO (Rattlestick), BINGO WITH THE INDIANS (The Flea), KINDNESS (Playwrights Horizons), THE METAL CHILDREN (The Vineyard), THE HALLWAY TRILOGY(Rattlestick), THE EDGE OF OUR BODIES (36th Humana Festival), DREAMS OF FLYING DREAMS OF FALLING (The Atlantic), and RED LIGHT WINTER (Steppenwolf, Scott Rudin Productions at Barrow Street Theatre), which won Chicago’s Jeff Award for Best New Work, an OBIE, and was named a finalist for the 2006 Pulitzer Prize. THE PURPLE LIGHTS OF JOPPA ILLINOIS, commissioned by Southcoast Rep, received its world premier at the ’14 Pacific Playwrights Conference, and he will direct its Off-Broadway premiere at The Atlantic Theater Company this Spring. Prior to that he will also be directing the world premiere of his new play, WOLF IN THE RIVER, Off-Broadway, at The Flea Theater. He has published eight novels for young adults, including The Buffalo Tree (Front Street Books, 1997), Under the Wolf, Under the Dog (Candlewick Press, 2006), which was a finalist for the L.A. Times Book Prize, Punkzilla (Candlewick Press, 2009), which was named a 2010 Michael J. Printz Honor Book, and The Children and the Wolves (Candlewick Press), which was named one of the Best Books of 2012 by Kirkus Reviews. He is also the author of the adult novel, The Year Of Endless Sorrows (Farrar Strauss & Giroux, 2006), and the graphic novel, Ball-Peen Hammer (First Second Books, 2009). As a filmmaker he wrote and directed the feature, WINTER PASSING, for Focus Features and Stratus Films. Starring Ed Harris, Zooey Deschanel, and Will Ferrell, WINTER PASSING was an Official Selection of the 2005 Toronto Film Festival and was released in February of 2006. His second feature, BLACKBIRD, which he adapted from his play, won Best Narrative Feature at the Charlotte Film Festival, and received a Special Jury Award for Achievement in Directing from the Florida Film Festival. BLACKBIRD was an Official Selection of South by Southwest and The Edinburgh Film Festival. Recently, he directed the feature LOITERING WITH INTENT, which stars Marisa Tomei and Sam Rockwell, and was released in theaters this past January. He directed the world premiere of Karen O’s psycho opera, STOP THE VIRGENS, for The Creators Project at St. Ann’s Warehouse, which was then selected for The Vivid Live Festival, where it sold out the Sydney Opera House for six performances. He also directed Sam Shepard’s TRUE WEST at Actors Theatre of Louisville, which went on to be named one of the 2012 Best Moments in Culture by Louisville’s N.P.R. Affiliate, WFPL. His production of FINER NOBLE GASES garnered a Fringe First Award at the 2006 Edinburgh Fringe Festival, where he received The List’s Best Newcomer Prize. His most recent novel, KNOW YOUR BEHOLDER, was published in hardcover by Little Brown & Co. in March, ’15, and is due out in paperback in Feb., ’16. His playwriting honors include Boston’s Elliot Norton Award, The Helen Merrill Prize, The 2006 Princess Grace Statue, a Lucille Lortel Playwright’s Fellowship, and The Benjamin H. Danks Award from the American Academy of Arts and Letters. PEN recently honored him with the PEN/Laura Pels International Foundation Award.